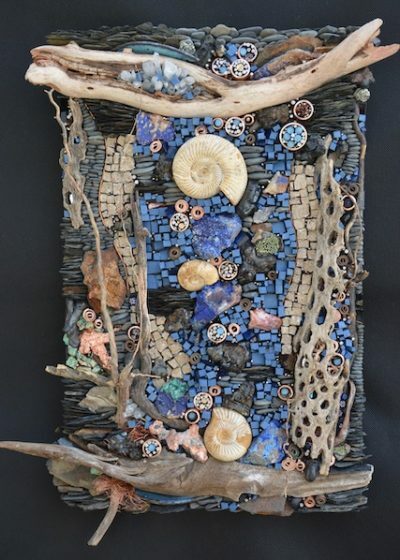 Visual artist Karen Klassen has always created art. 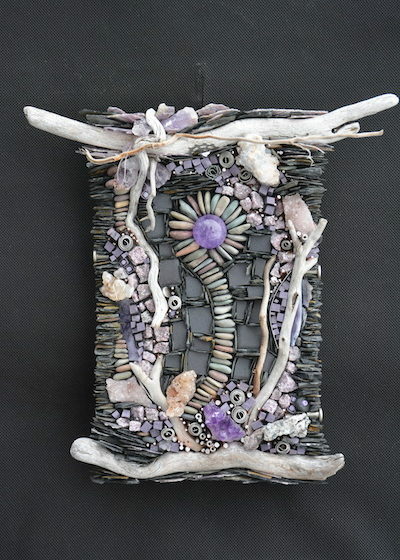 From drawing as an adolescent to floral designer/business owner and many classes and experiments in between. 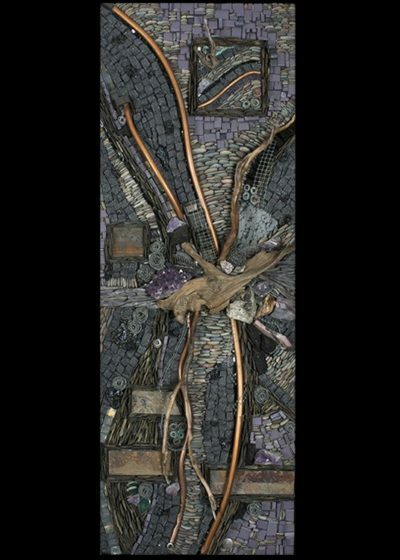 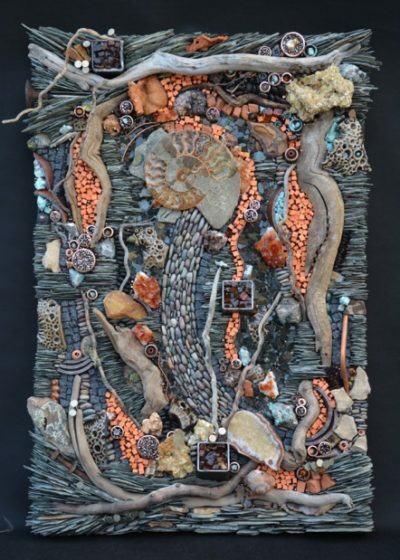 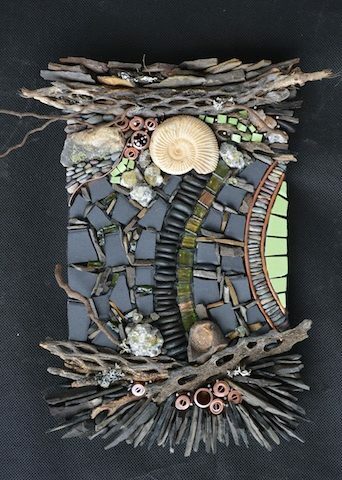 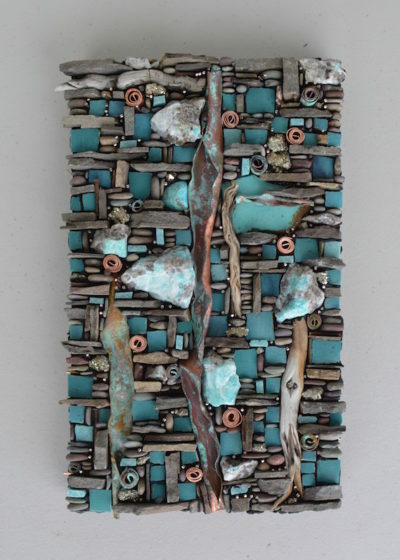 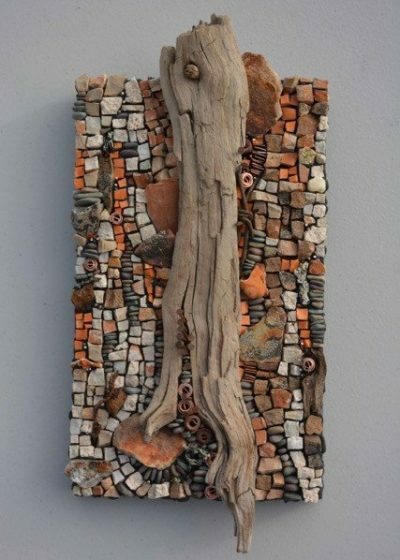 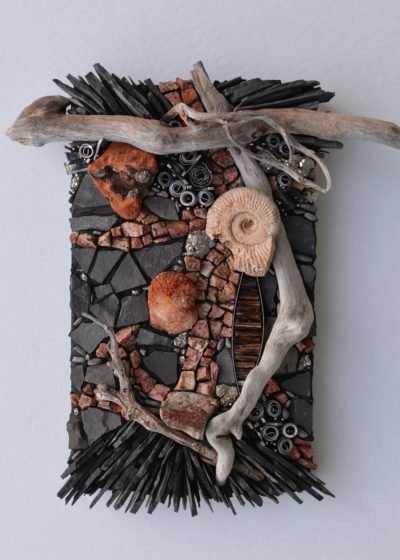 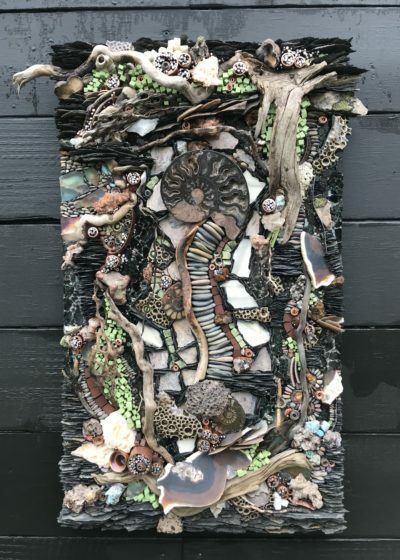 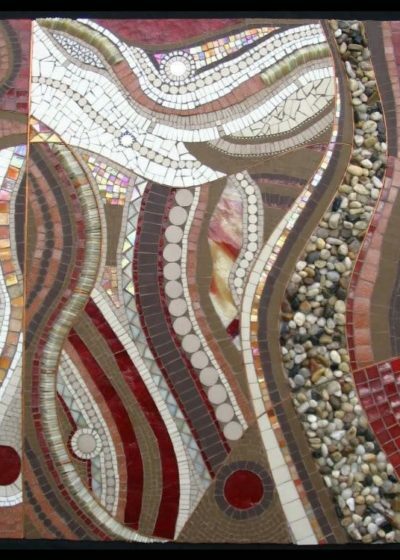 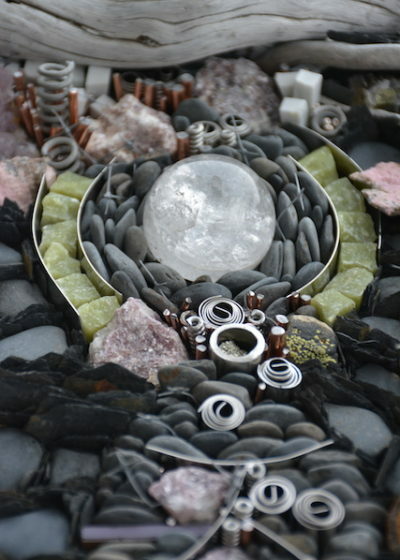 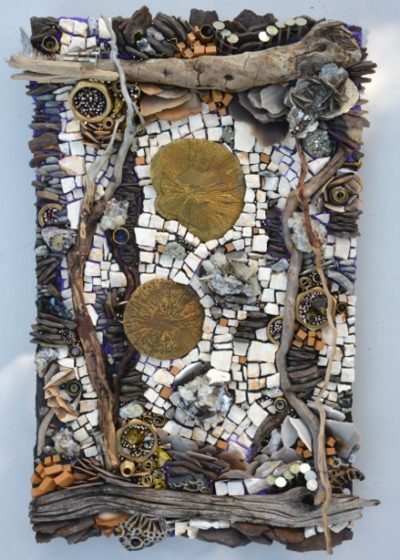 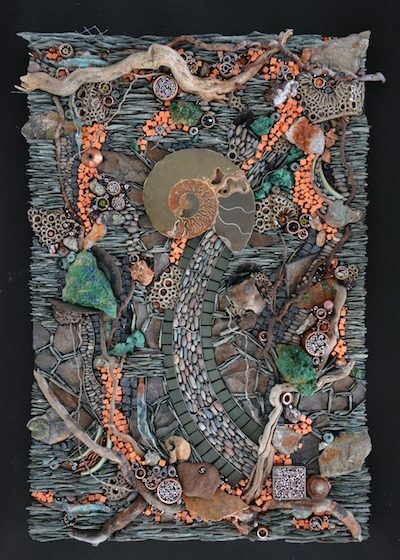 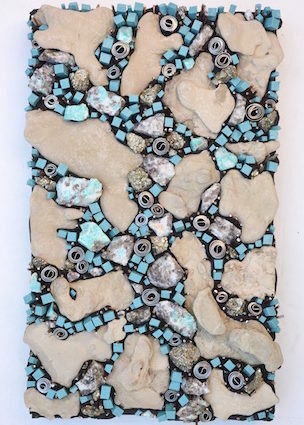 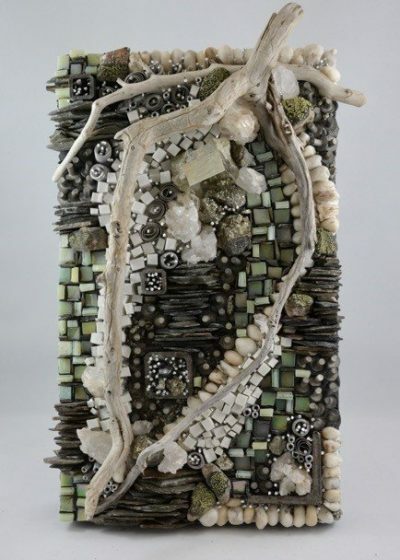 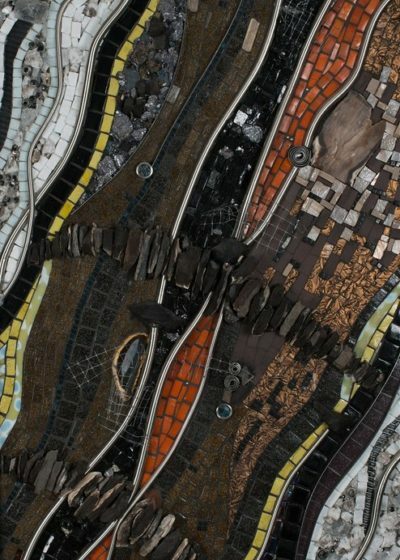 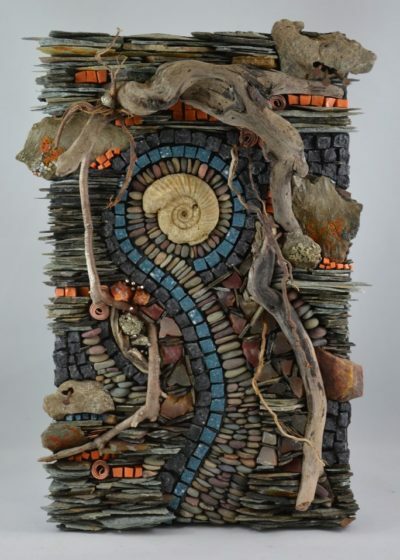 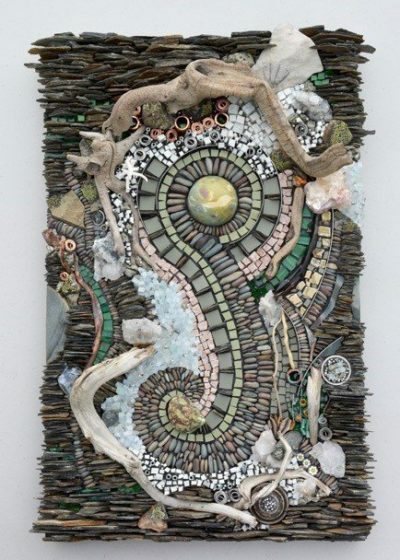 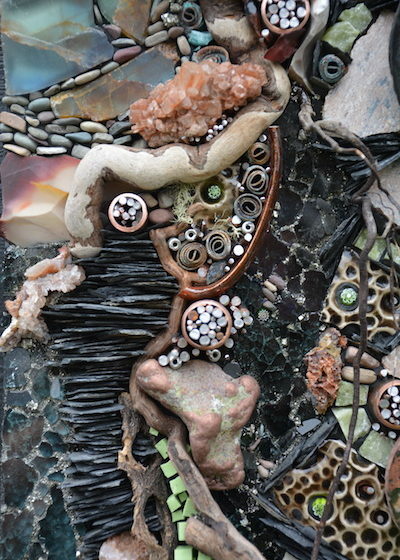 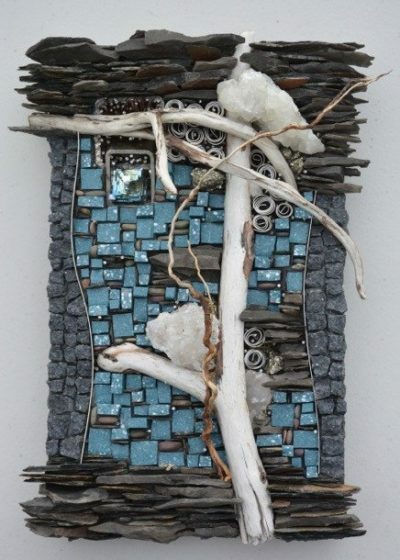 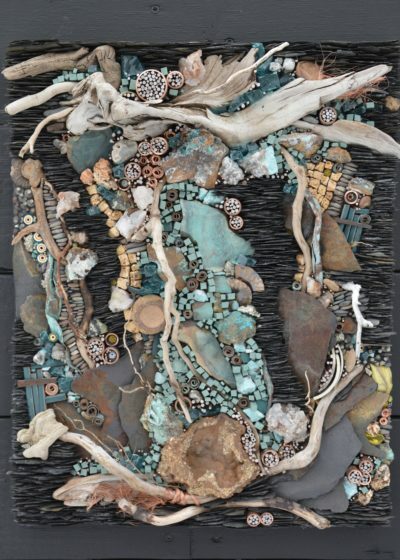 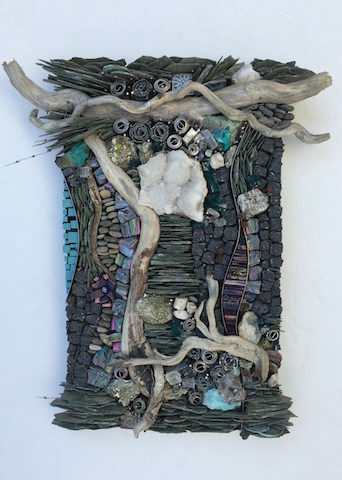 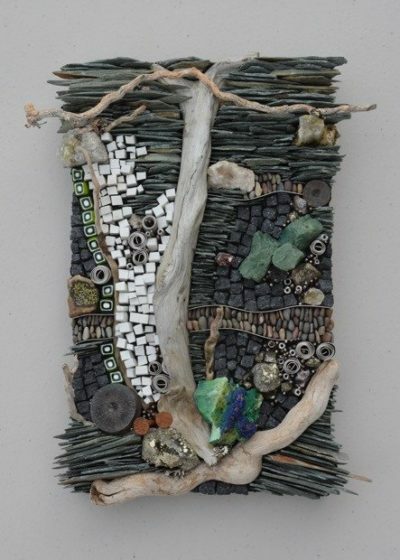 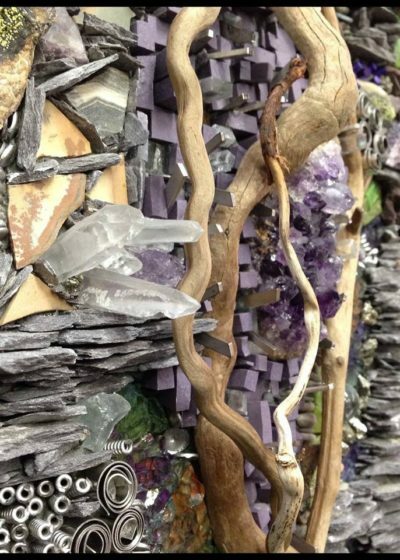 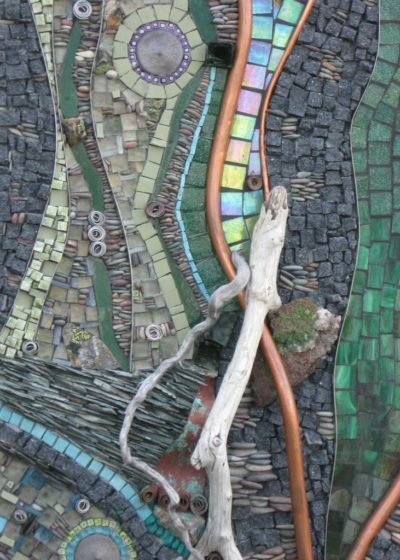 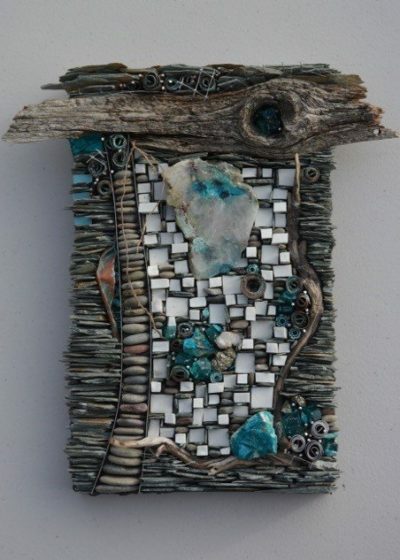 Karen`s contemporary mosaics are a celebration of the natural world and an exploration of imagination. 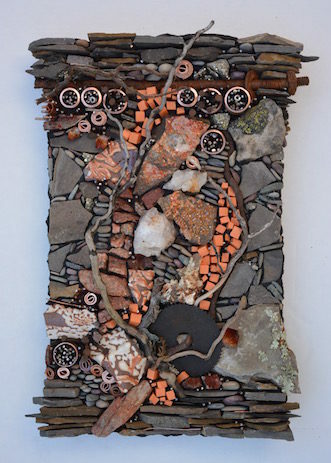 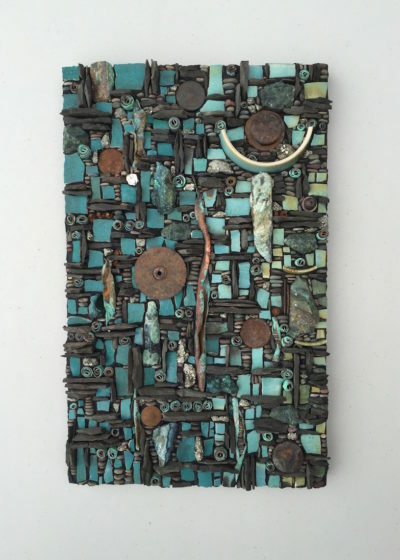 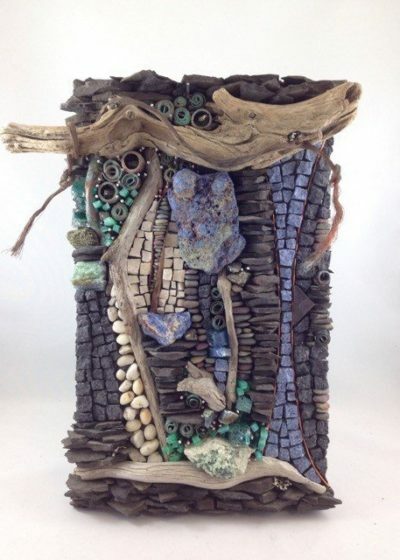 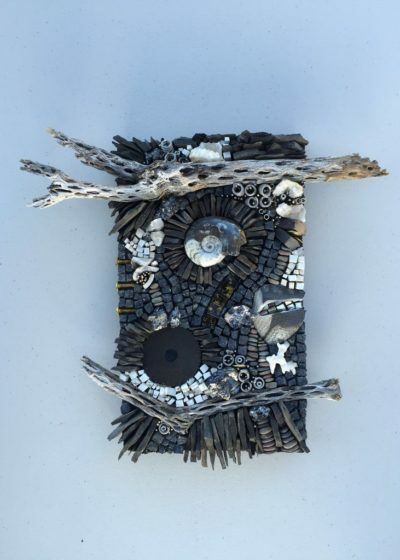 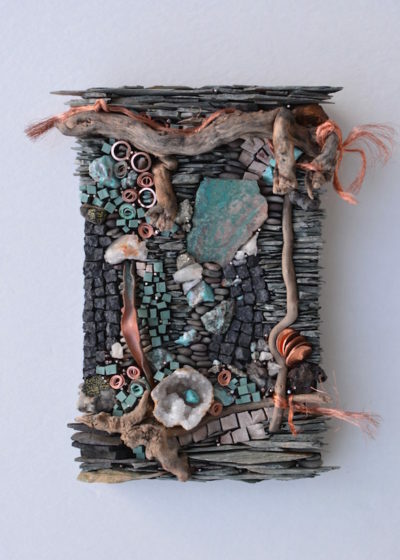 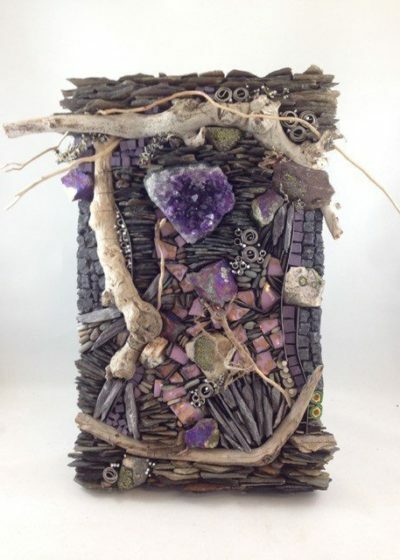 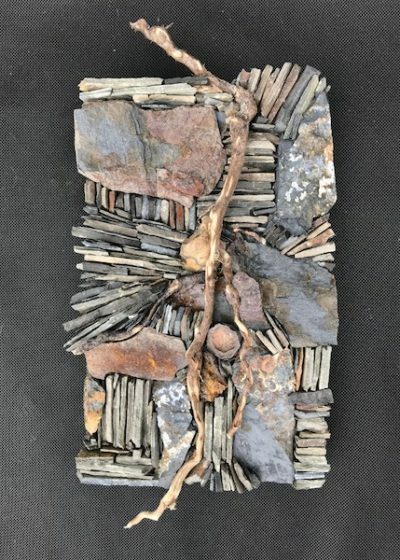 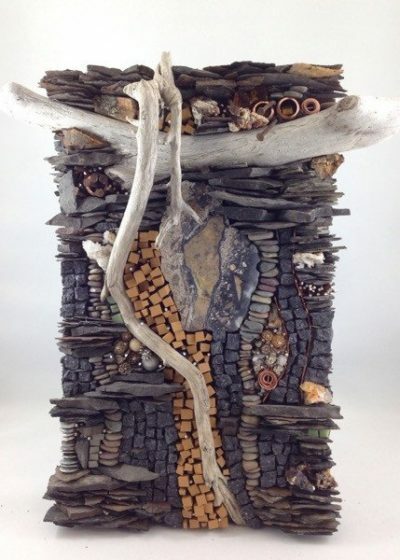 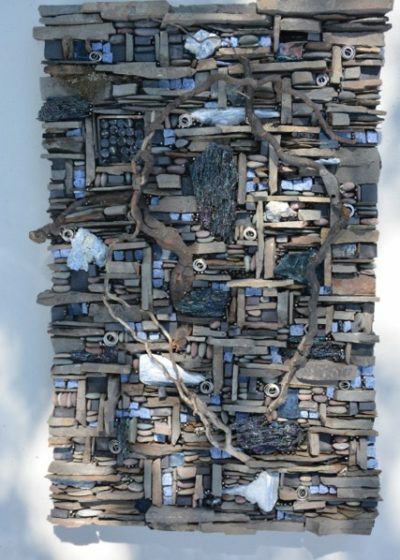 Creating and experimenting with materials, texture, and color, she sees unexpected potential in a variety of materials. 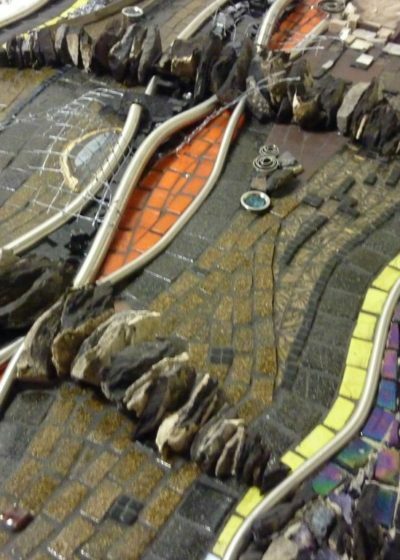 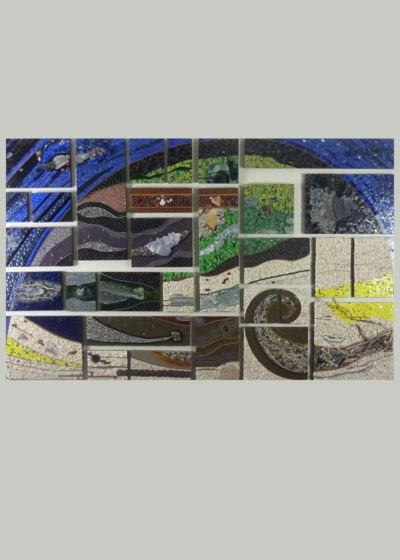 Karen creates fine art mosaics for residential, business, gallery, and public. 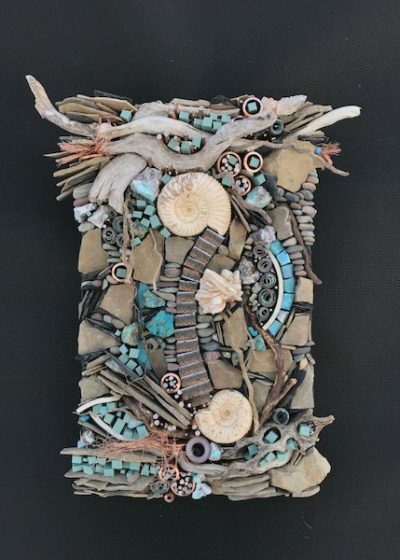 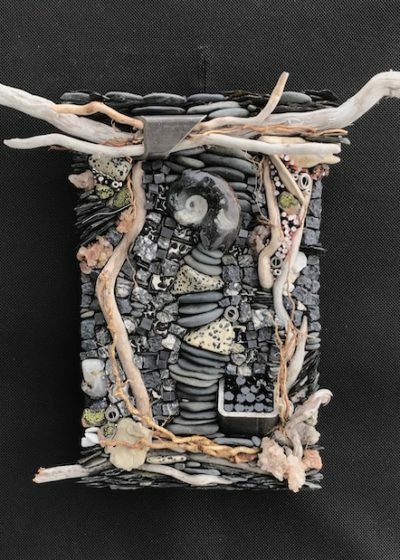 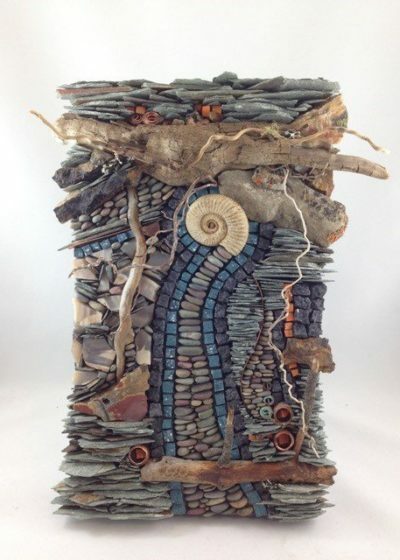 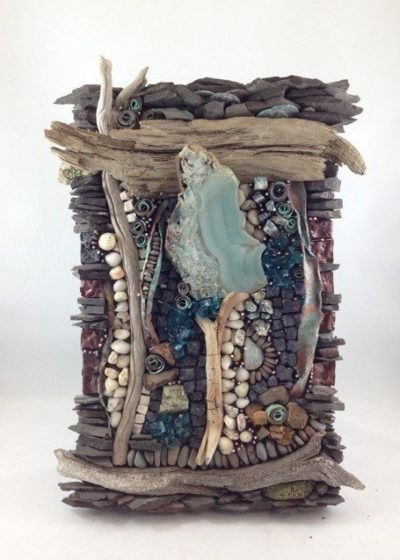 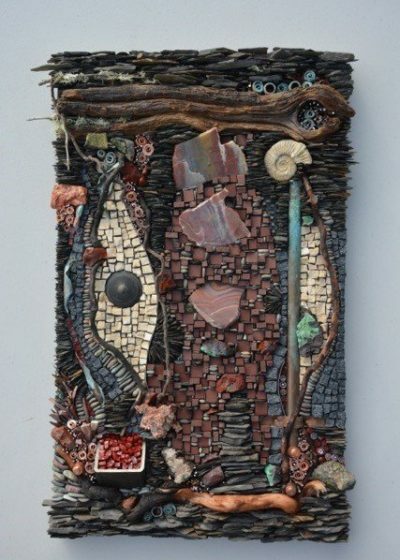 Karen continues to hone her skills in mosaic and sculpture and is a member of Society of American Mosaic Artists. 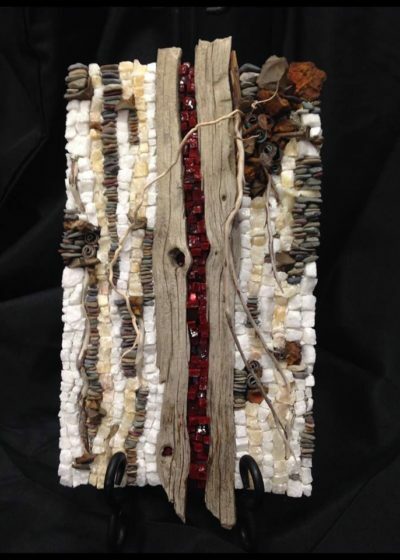 Born in Edmonton, Karen grew up on an acreage just north of Edmonton, in Namao. 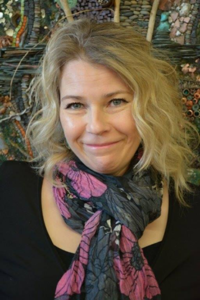 Playing outside, climbing trees, and playing with the dogs , horses and her pet goat, gave her appreciation for the simple things in life. 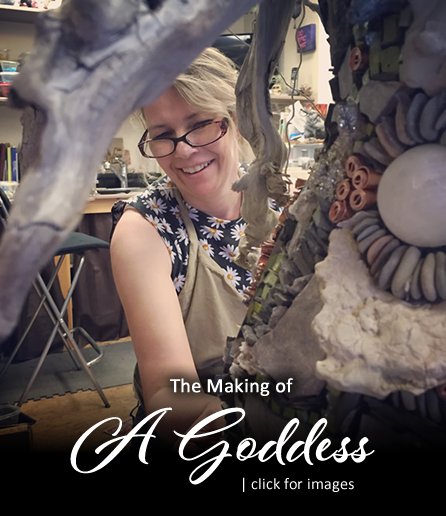 Growing up with such a creative mother and entrepreneur parents provided Karen with the foundation to dream, succeed and live life to the fullest. 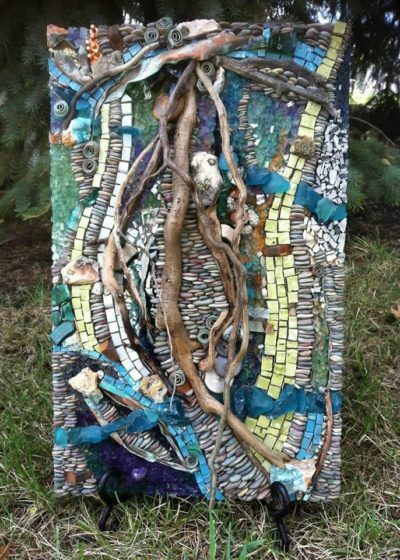 Moving to Edmonton after graduating, she began working full time in the family owned flower shop. 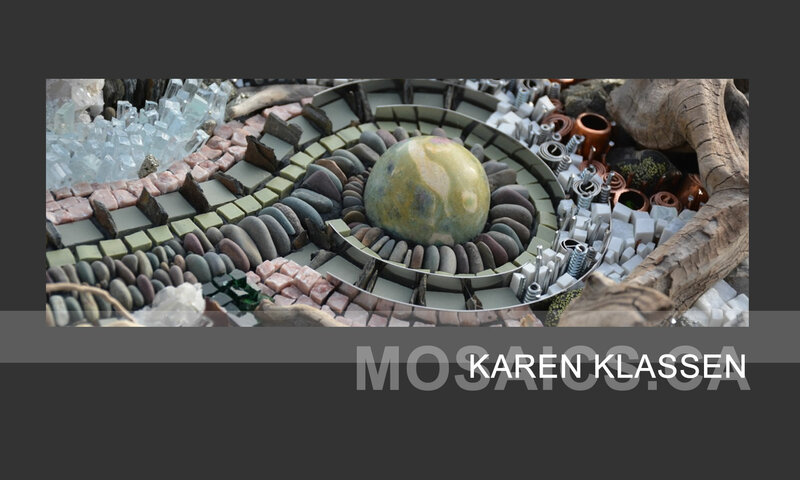 At the age of 20, Karen became the owner of the flower shop and her artistic and business career flourished. 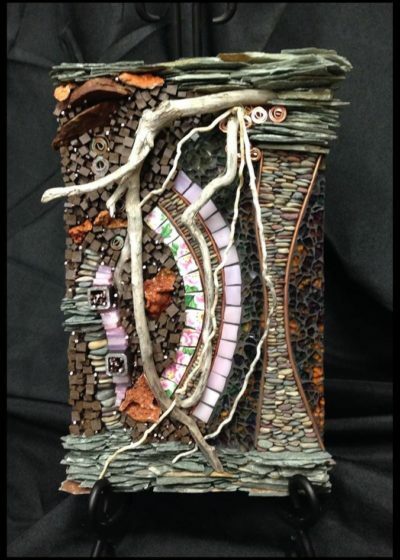 After a 13 year success, Karen sold the business to start a family and began to explore many art mediums. 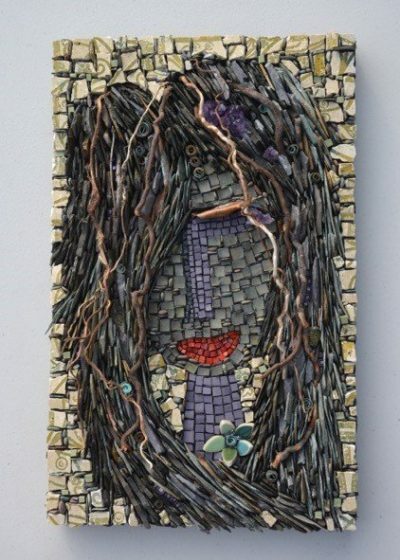 In 2005 she discovered mosaics and began developing her skills. 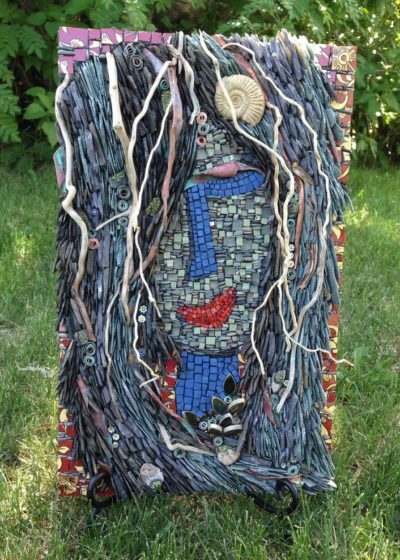 2007 was Karen`s first solo show at the Art Beat Gallery, in St.Albert. 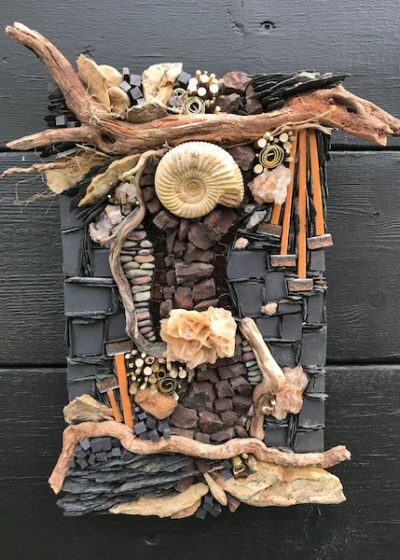 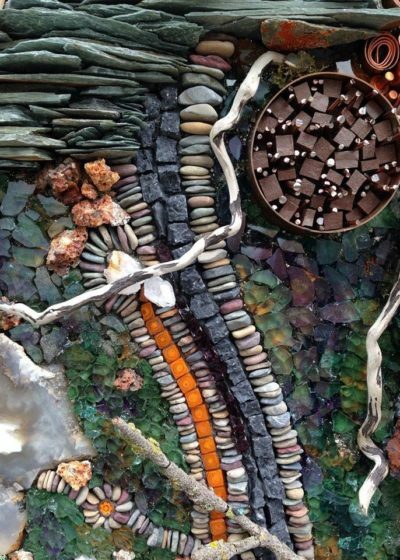 Susan Jones of the St. Albert Gazette writes, “ Colour flows though her art the way a river might flow over rocks and stones. 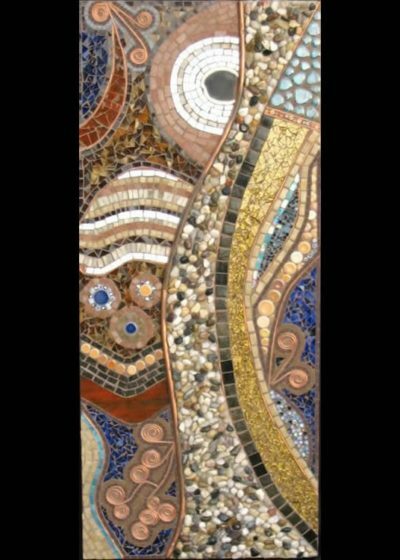 Some of her mosaics appear as if lifted from a desert, while others are more reminiscent of the sand mandalas made by Buddhist monks”. 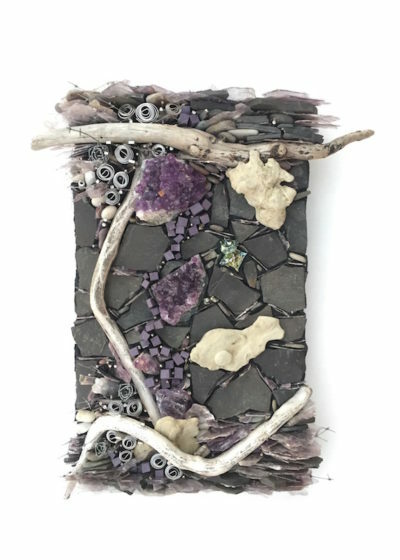 Her goal is to create works of art that are inspirational, timeless and can transport us temporarily to higher levels of consciousness. 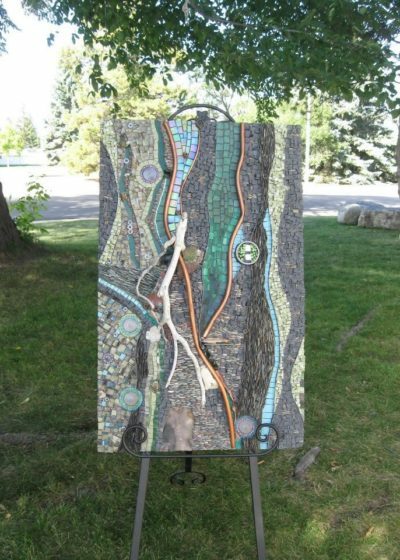 Karen`s mosaics can be seen at current events, galleries, and festivals throughout Edmonton. 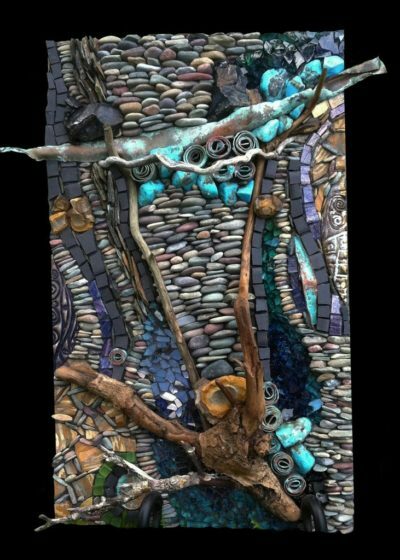 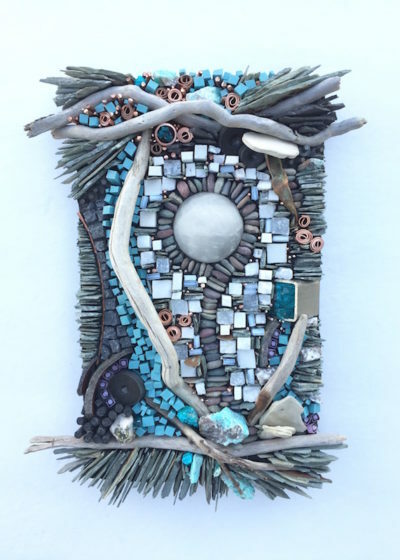 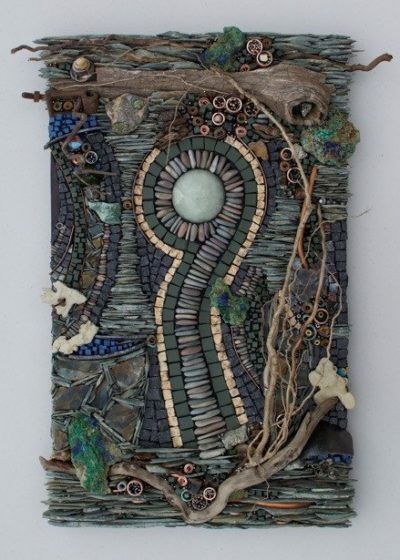 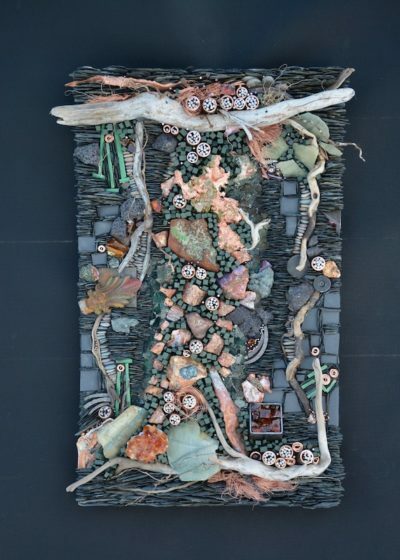 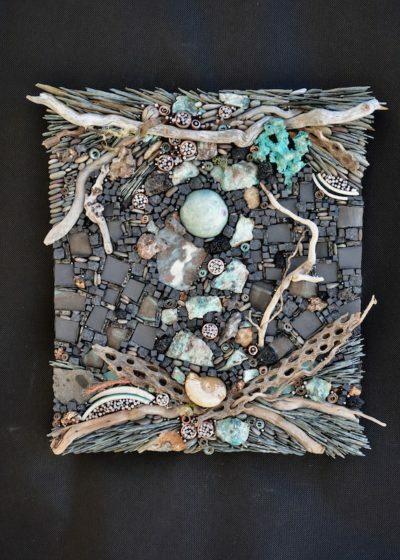 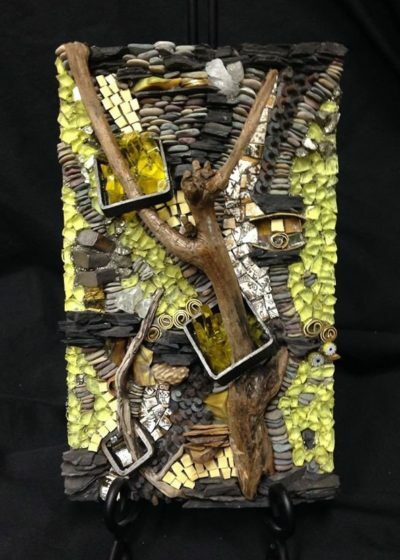 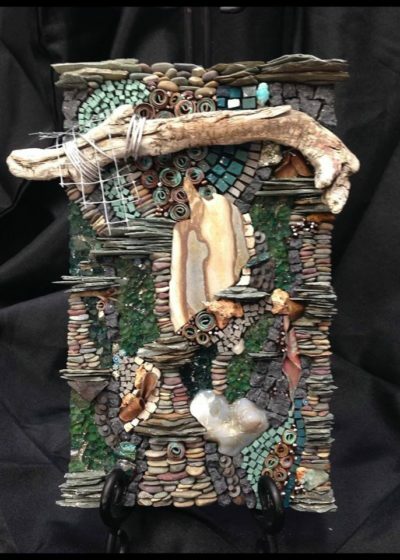 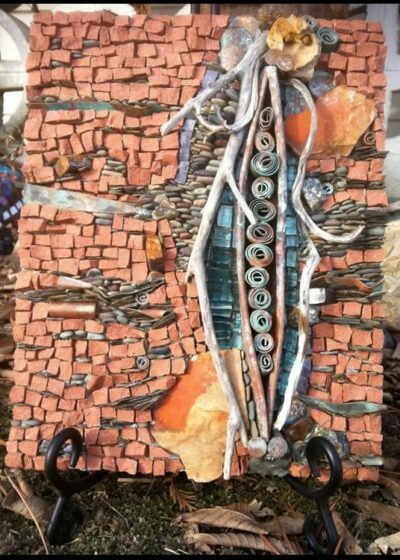 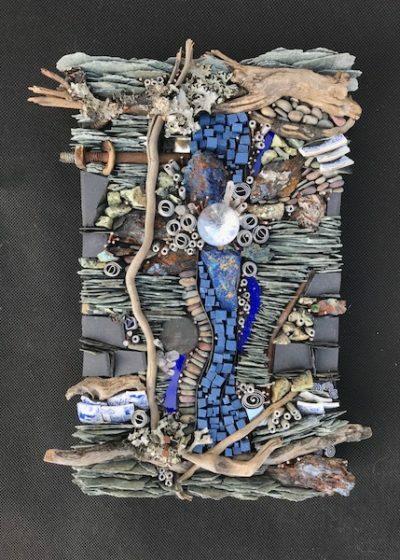 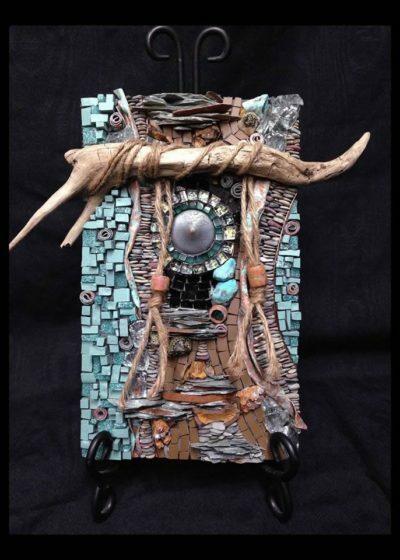 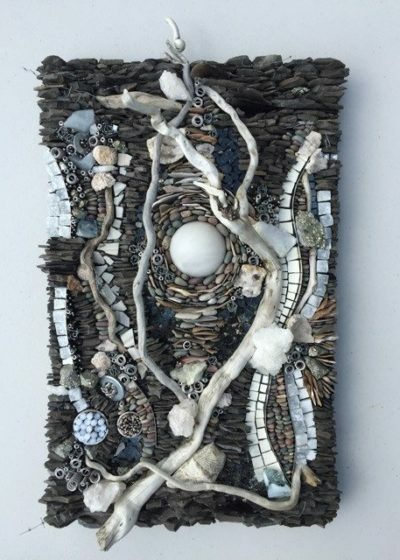 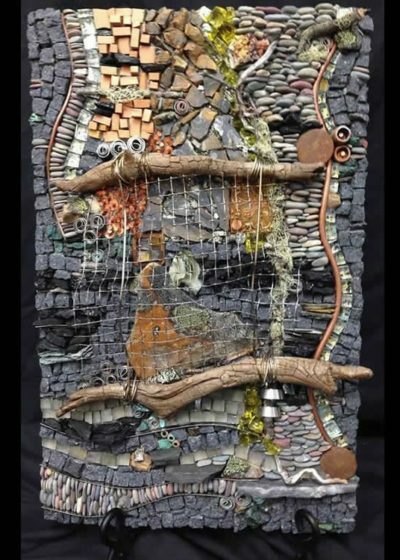 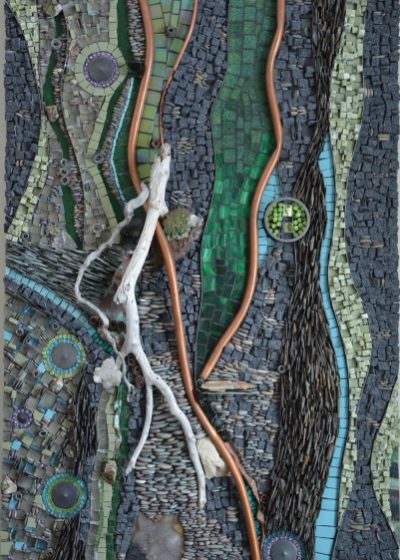 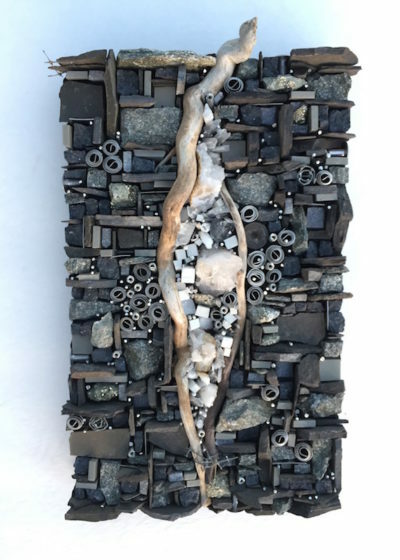 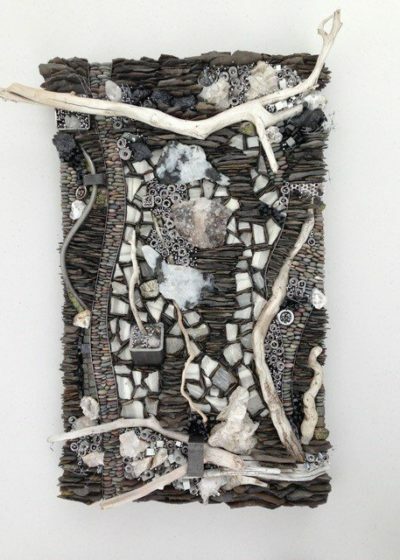 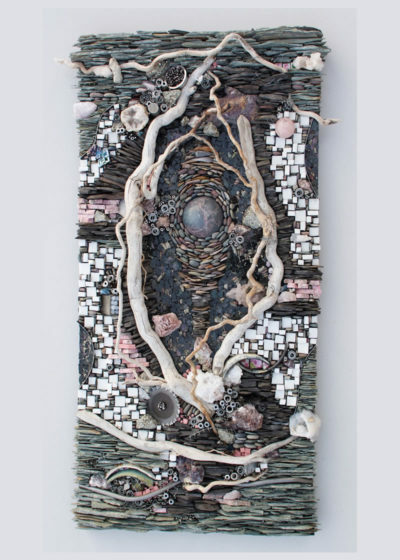 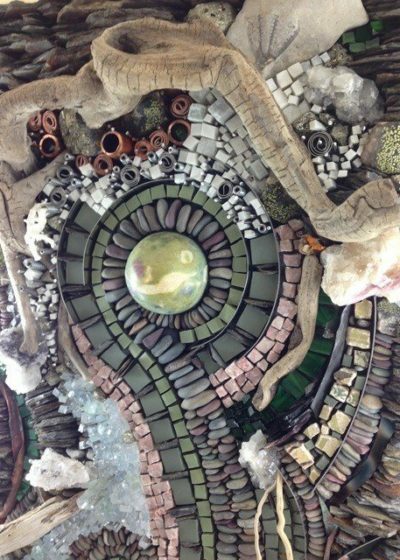 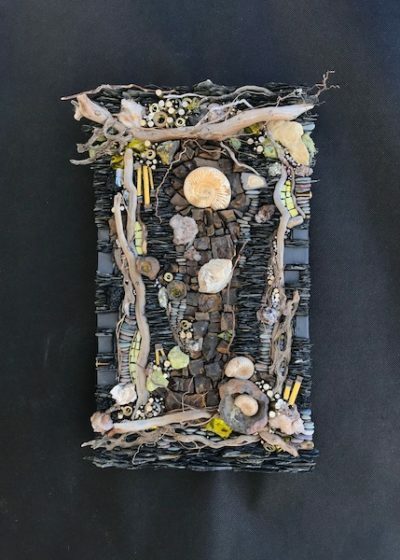 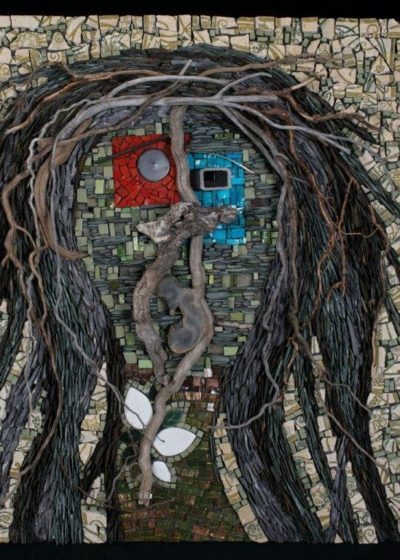 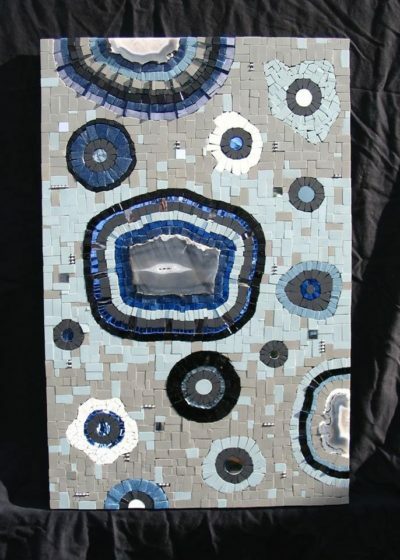 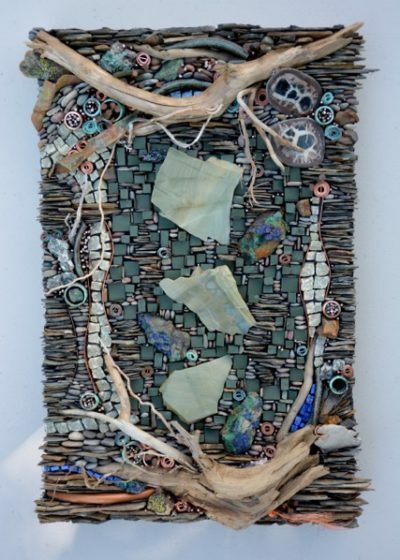 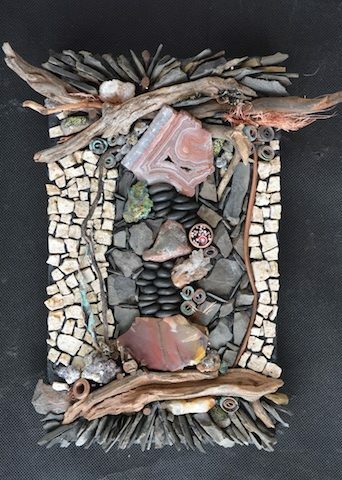 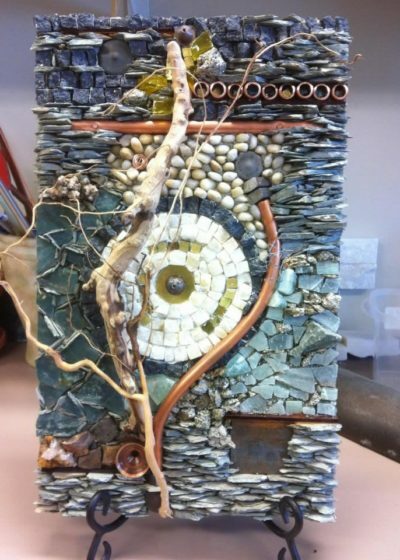 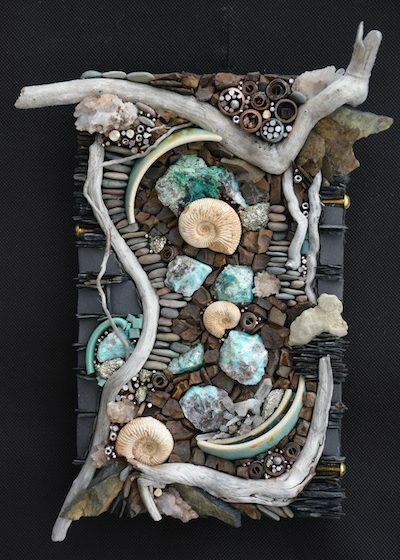 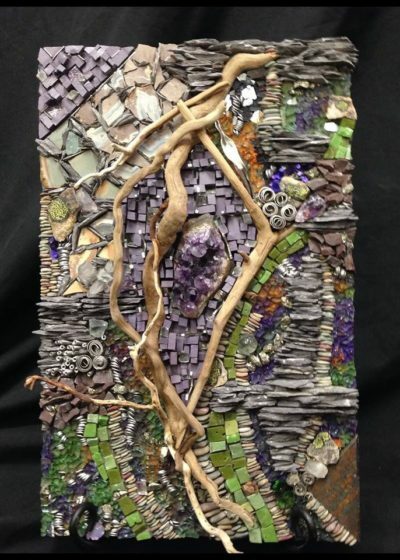 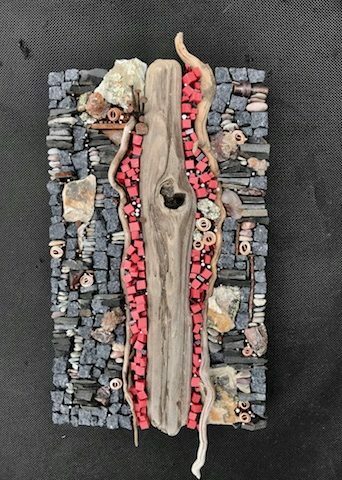 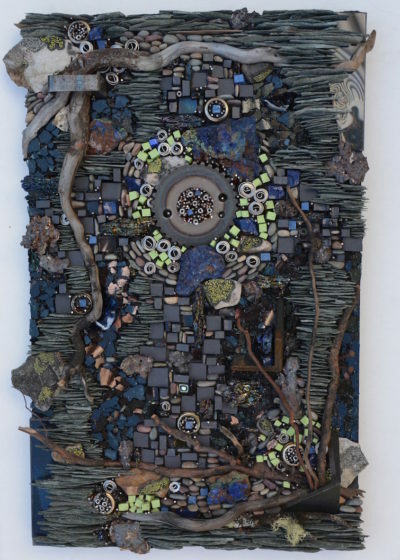 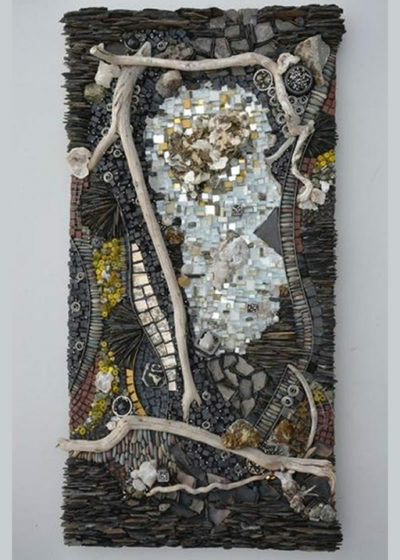 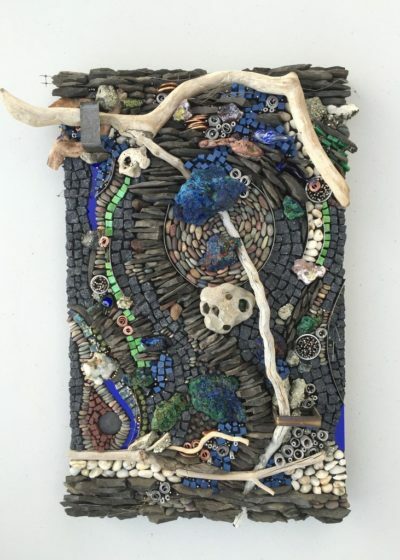 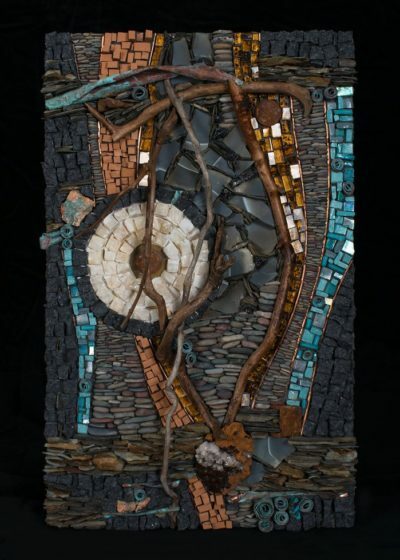 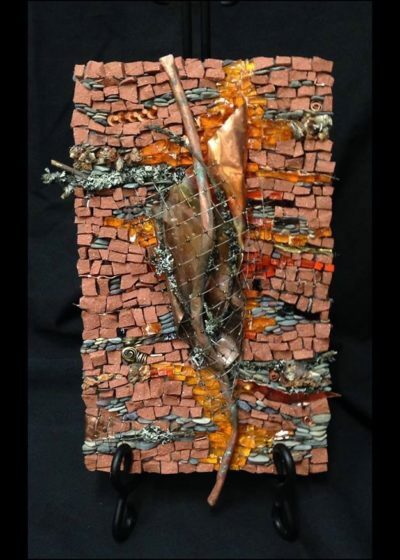 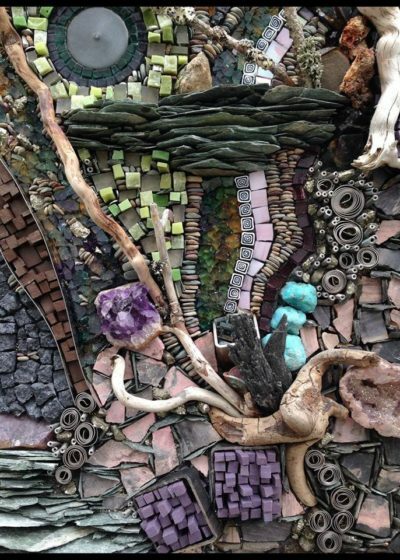 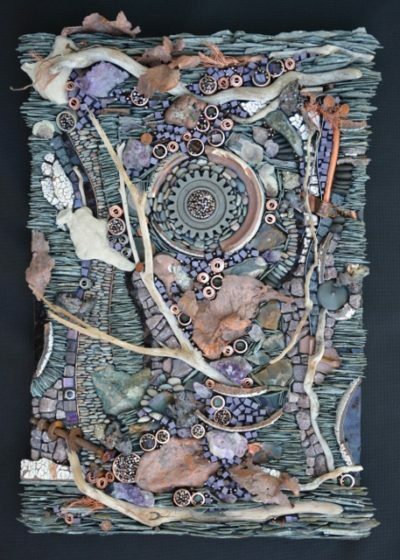 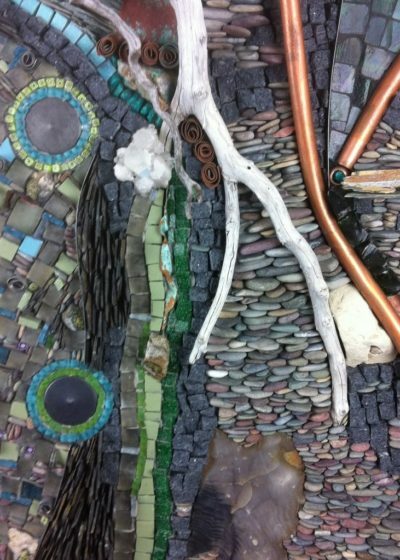 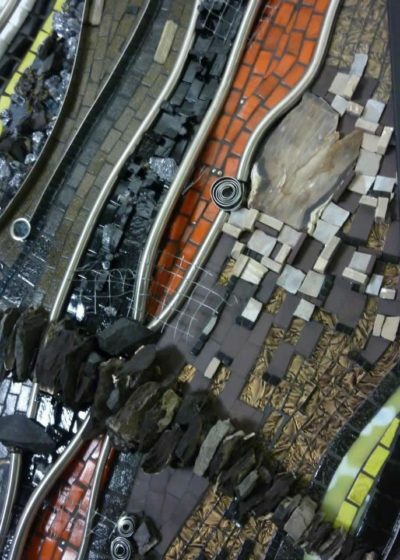 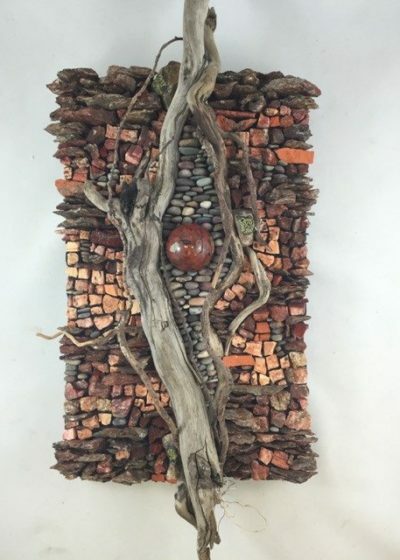 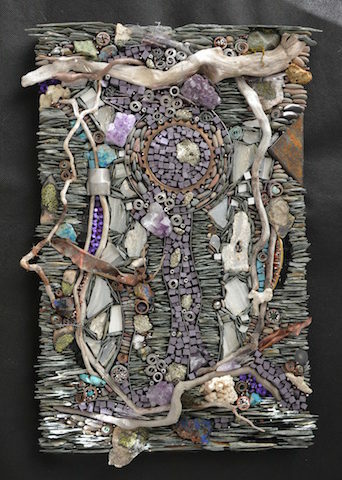 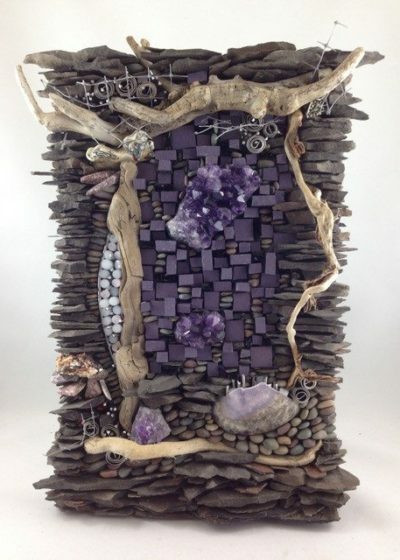 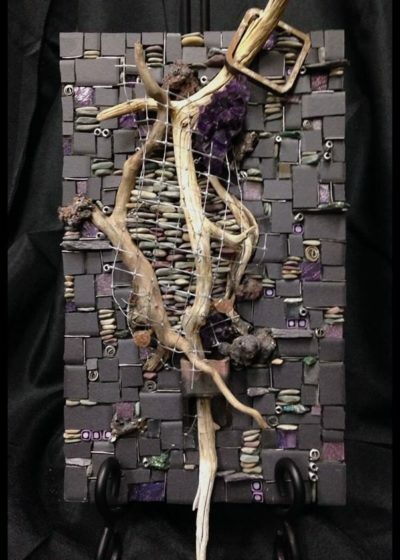 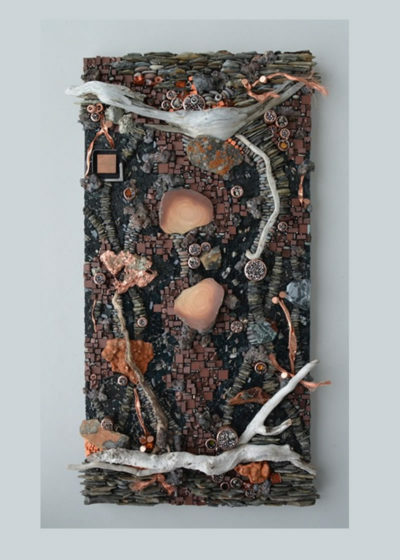 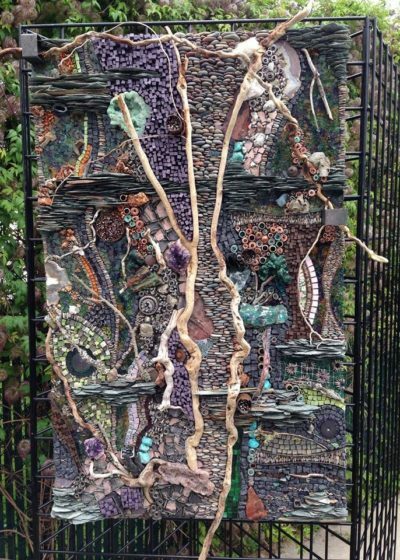 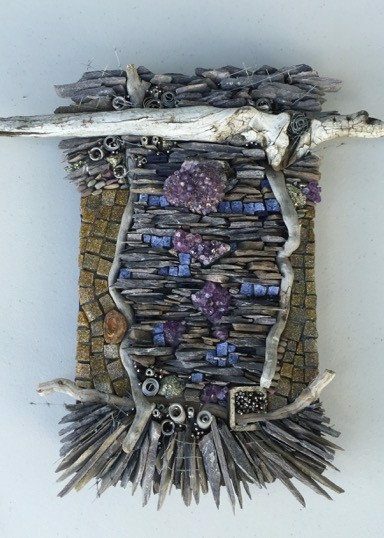 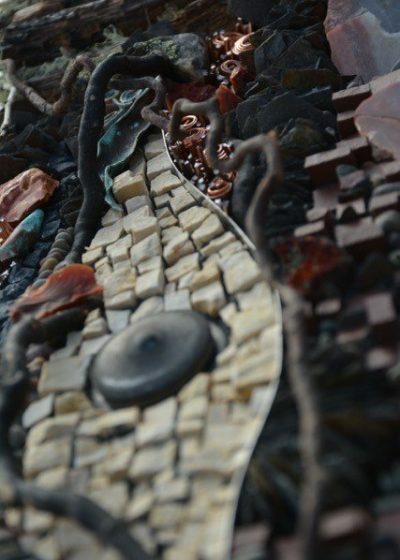 Her mosaic artwork “cells” was selected for permanent display at the Edmonton Cross Cancer Institute. 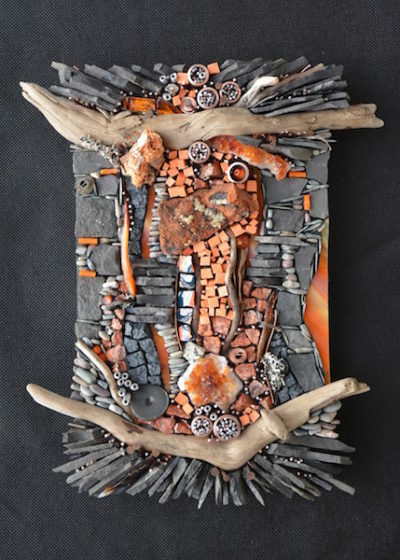 She believes that art sets down a distilled expression of the human spirit, one that`s tangible in form and accessible to all. 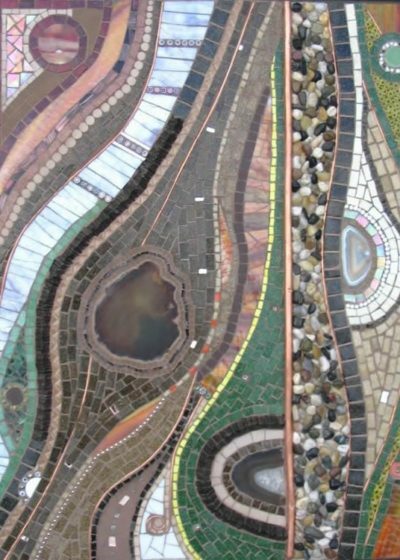 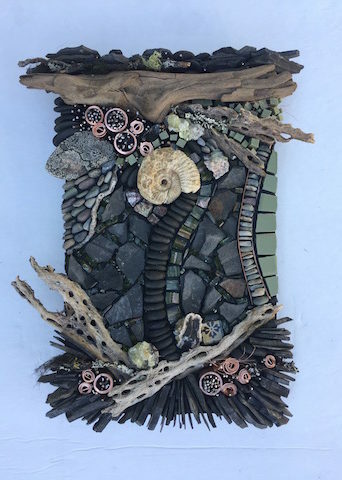 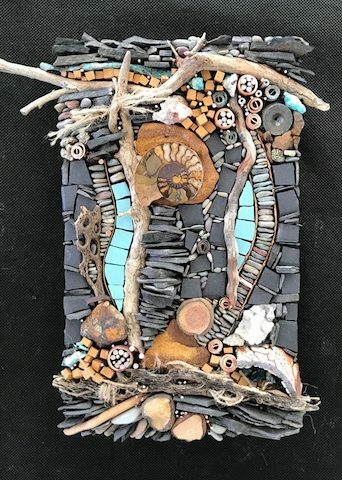 Karen continues to hone her skills in mosaic and sculpture as well as assists and fabricates with local mosaic artists for public and private projects. 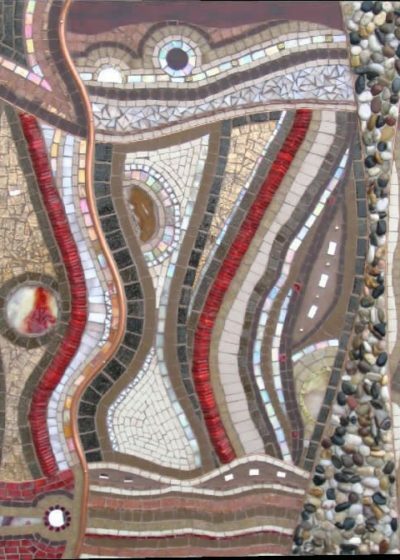 My mosaic Wall Art series are designed to be featured on a wall and range in size, orientation and format. 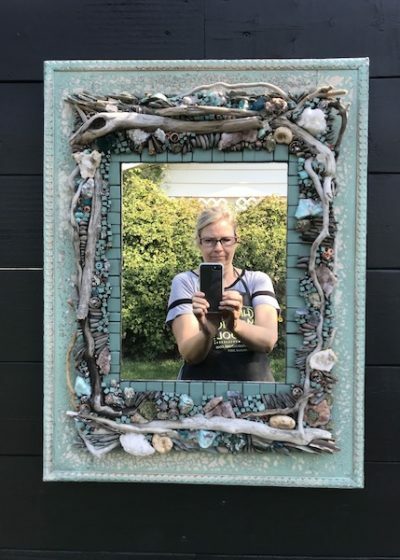 I can do custom pieces upon request. 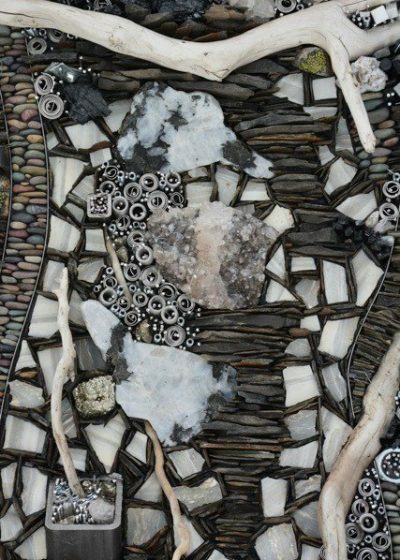 I am attracted to patterns, hidden and secretive paths, the desire to show something unexpected. 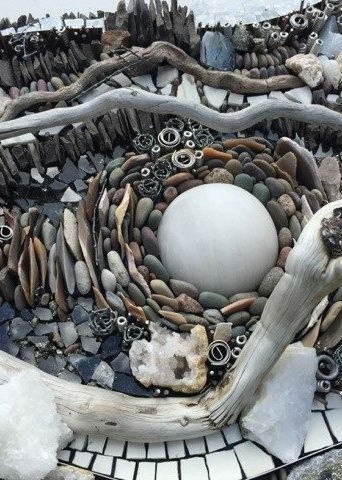 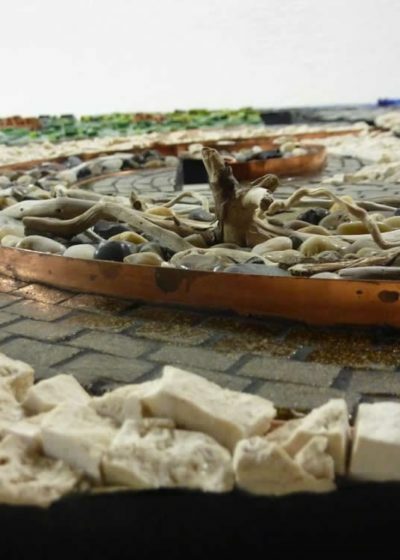 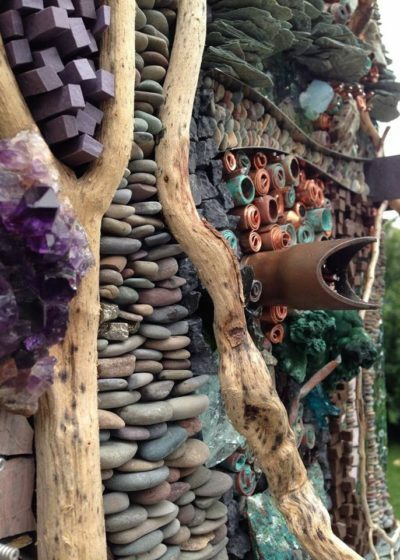 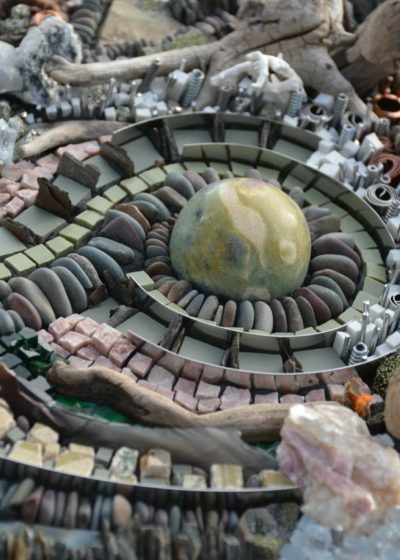 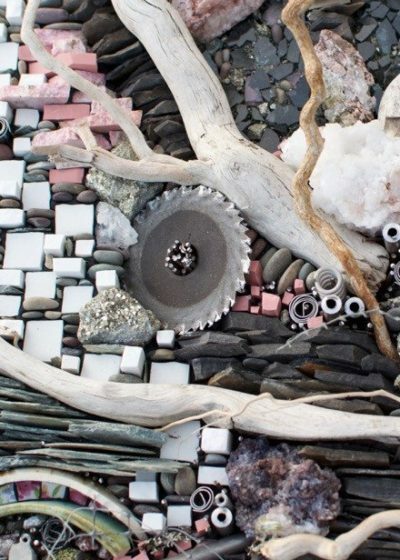 The compositions are created with local stone, pebbles, and wood. 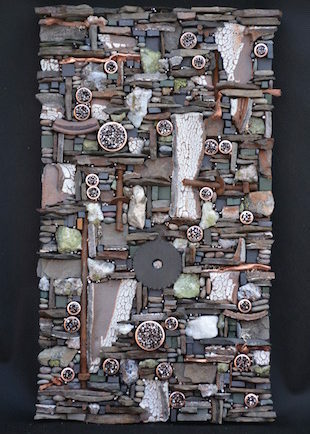 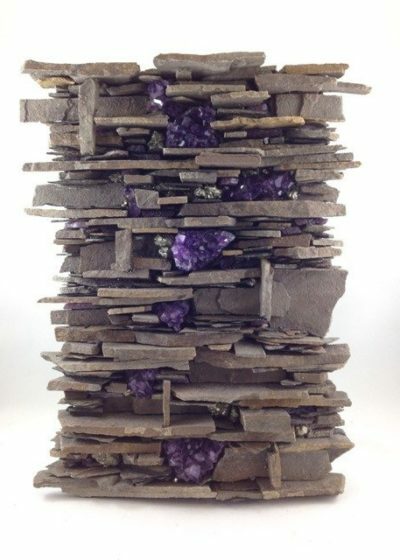 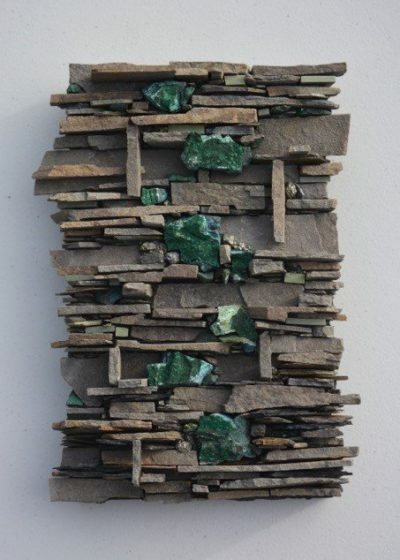 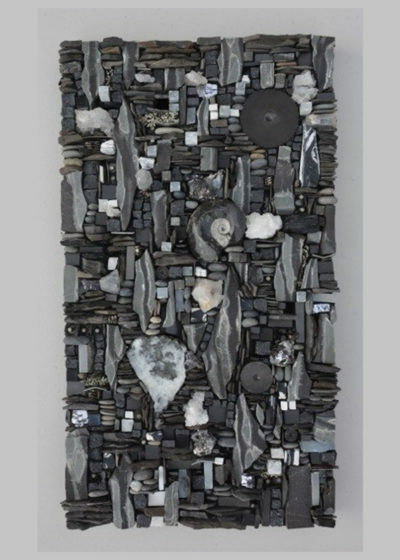 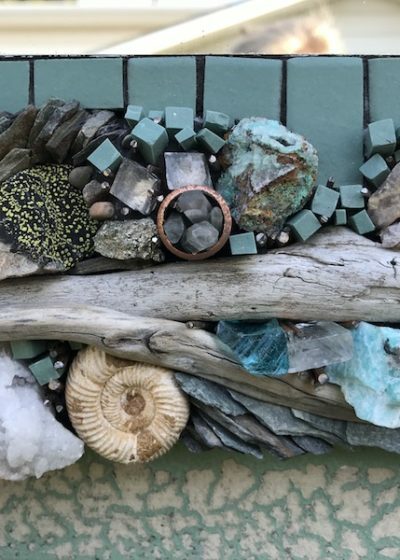 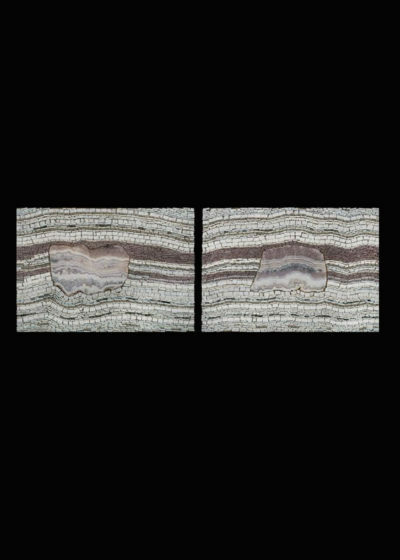 In addition to my local stone, I incorporate metal, minerals, semi-precious stone and carefully sourced material from all over the world. 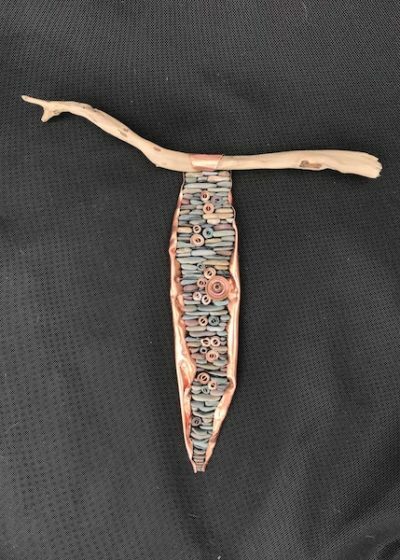 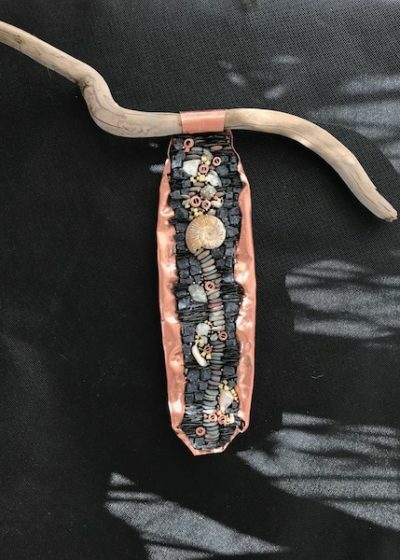 Copper Pod: AVAILABLE at Wild Orchid Boutique Florist 10136-105st Edmonton. 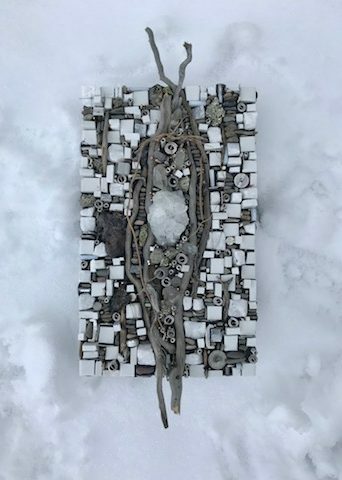 Goddess of Strength AVAILABLE 10" x 16"
Holy Apatite SOLD 10"w x 16"
My Jewelry pieces are created with high quality silver, brass, copper and leather hardware and are designed to be attractive and long lasting pieces that you are sure to love. 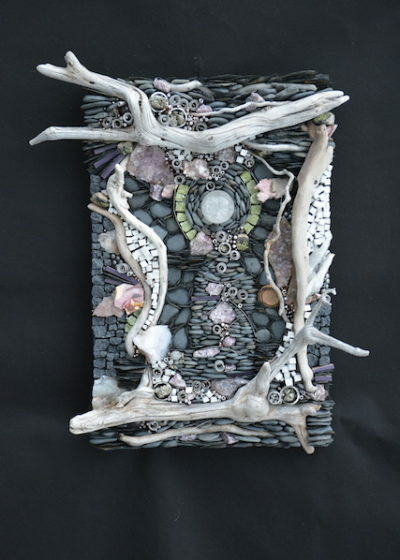 They are sure to make a personal statement and are great for gifting. 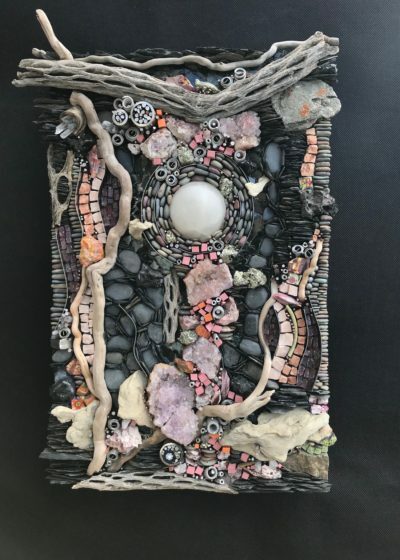 I believe we all have the ability to create our own journey and we all share the creative force of nature and creativity within us. 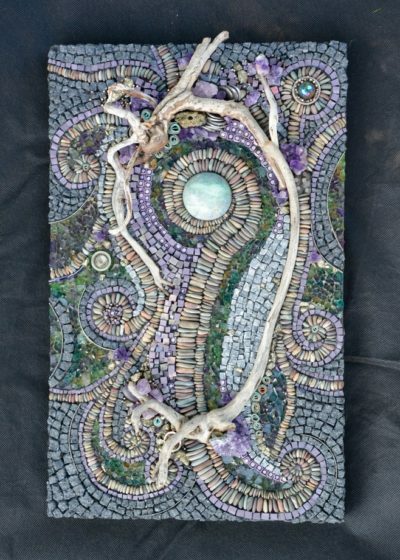 My journey has been a spiritual and enlightening one. 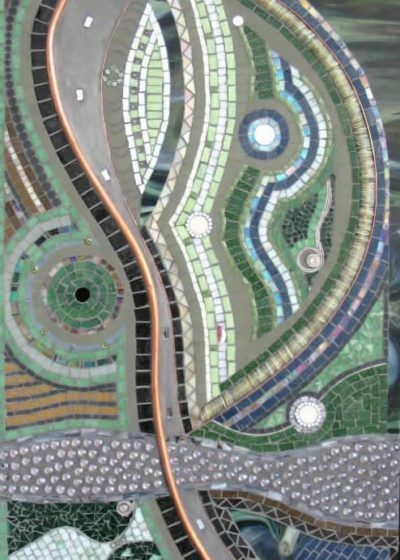 I am grateful and fortunate to tap into this with the historic art medium of mosaic.